Synopsis: Spectacular, scientific, and educational cultural practices were used to establish and define public identities in the British colonies of nineteenth-century Canada. In Visibly Canadian, Karen Stanworth argues that visual representations were the era's primary mode of expressing identity, and shows how the citizenry of Quebec and Ontario was - or was not - represented in the visual culture of the time. Through nine case studies, each representing key moments of identity formation and contestation, Stanworth investigates how a broad range of cultural phenomena, from fine arts to institutional histories to public spectacles, were used to order, resist, and articulate identities within specific social and economic contexts. The negotiation and planning underpinning civic culture are evident in rare moments of compromise such as the surprising proposal from the Saint-Jean-Baptiste Society to merge their annual parade with the celebration of Queen Victoria's Diamond Jubilee in 1897. Equally astounding is the scale of nineteenth-century public spectacles; reenactments of Victorian scenes of war often attracted crowds of upwards of 10,000 people. Illustrated with over fifty images, many unseen for over a century, Visibly Canadian establishes the extraordinary significance of artwork and public spectacles in cutting across language, religion, and class to tell stories of nationhood, belonging, and difference. About the Author&colon; Karen Stanworth is associate professor in the faculties of education and fine arts at York University. Michener & Rutledge Booksellers, Inc.
7. 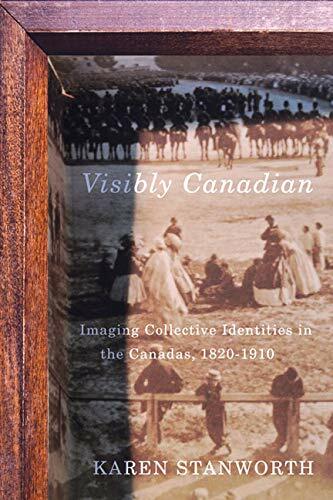 Visibly Canadian: Imaging Collective Identities in the.